Trying find similar businesses advertising was difficult to find. I do remember the Office Sign Company was for a short while showing up on my feed on Facebook with ads for specific signs they made. Another company that I cannot recall the name would show You Tube commercials almost every time I wanted to watch something. They offered advice on how to mount a sign so that it can be moved if the business moved instead of sticking it to the wall. I thought the advice may be handy for some business. The video and narrator was a bit amateur which can be less effective. Other than that I have not come across any competitor ads even while trying to look for them. I found it to be difficult to find ads and advertising they use. I will have to come back and add to this post if I come across more information on advertising. Looking through LinkedIn and Google+ I find that groups and "communities" I Google+ are a great way to interact with likeminded people and business owners. Using these features will be a must for my business, especially since I am a business to business, making other business contacts through groups can only help. Of course I have to provide useful and relevant information and ideas, I am interested in looking for topics of interest that I can add my thoughts to. Finding groups and making my own look easy on each of the mediums. LinkedIn, with one click allows me to find groups that I may be interested in joining based on my interests. It goes right to those groups without me having to go searching for them. That is a good start, however I will spend some time finding others. I would join my industry groups, but other groups that I think would be a target market, maybe to offer insight and useful information about signage and branding logos. Additional online marketing tools I think that can benefit my business are LinkedIn and Google +. I may also consider Yelp and Groupon, but as a business to business owner, the first two are more likely to be the best fit. LinkedIn, as mentioned in the Get up to Speed with Online Marketing book by Jon Reed, states that LinkedIn is especially important for B2B businesses. There I can make connections with other business people and owners. This is my target audience so that medium will be a must for Mill Works. Being right in the middle of networking for people that may be seeking my products is possibly the best social media forum even over Facebook and Twitter. I will experimenting with all of them to see which one yields the best return. While we know that exterior logo signs are necessary for a storefront, interior signage can be just as important. Once customers are in your store or business, make the most of this opportunity to show your story, your brand and make a lasting impression. Making your store location clear, and guiding customers to important places in your business can be done by showing your logo clean and clear. Do you want to impress your customers? 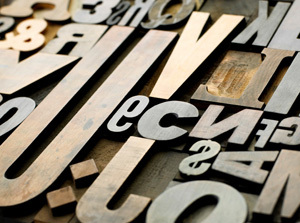 Here are five reasons your business needs more signage. This month only! Mill Works would like to give back this month as a thank you for any purchase you make. Take advantage of this sweet gift before the month of April ends! 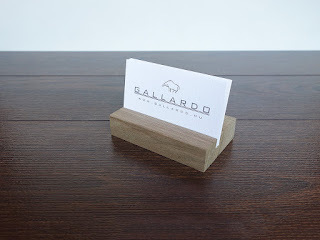 Originally priced at $17 each your free business card holder holds approximately 25 business cards and your logo or name is laser engraved onto a solid piece of walnut wood. It can be stained your desired color and coated for lasting protection. When you call at 714-235-6141 or place your order online with any order this month, just mention this offer and your laser engraved logo card holder is on us. Just provide the name or logo and we will send it out with your order, just to say thanks for being a loyal customer. My business Mill Works makes signs and displays for businesses, so my emails and newsletters will consist of topics that relate to businesses, branding, logos and signs that they may be interested in. Other topics will consist of tips and suggestions for displaying signs, and ideas they can do with their logos and branding items. Others will be special promotions or discounts, special announcement or news that I may have. I would send newsletters and emails about once every 2 weeks. While Mill Works produces custom products and not products that are frequently needed, I would also not send emails frequently as to be too bothersome. I want to provide quality content to my customers and keep items coming in as good content comes available that provides useful information. Categories I am interested in making for my business blog will help keep my blog posts organized and useful for targeting certain audiences. I would first start a recent project or design category to organize my posts for new projects we complete that I think have good design that can be shown off. Another would be for sign industry news and info that I can post and share things that followers and target audiences could be interested in, offering them useful information about sign laws and uses for signage to boost sales and customer interest. Another will be special promotions for times I would like to offer something such as a discount, free items or any other promo to entice users to take advantage of. Next I would like to have a recent news on any newsworthy stories about the business. Another will be tips for those looking to get tips and ways to install, clean, setup or uses for signage and the other branding products I will offer. I will be wearing a lot of hats while starting my business making laser and handcrafted signs and displays. While making these items, I will also be putting in time for blogging, social media and other marketing. Since I am the face of the brand and not working for a corporation with a script, being personal I believe will work out in my favor. I do not plan on talking all about my personal life, but I will put in my personal opinions and character a bit to take away the one direction communication tactic and try to encourage a conversation. While speaking at a more personal level, readers can get familiar with who I am and the culture of the business. Making them comfortable and at ease so that they can approach my business with more confidence. Building trust and talking like an expert can help them take the next step.